It's another MM challenge, the first one for this month. I fell for this sketch the minute I saw it and set down right away to make a card. I used Stacey's color challenge - pink, yellow, red, black and white. When I saw that nut stamp at Michelle's I knew I'd use it with this sentiment (from Hero Arts) and had to buy it (for 1$ you would too...). 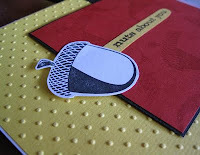 I stamped it with watermark ink and embossed the yellow paper. Greetings from Puerto Rico!I love the texture and colors in your card. Thanks for sharing. very cute! Thanks for playing the Curtain Call! Thank you for the warm comments!